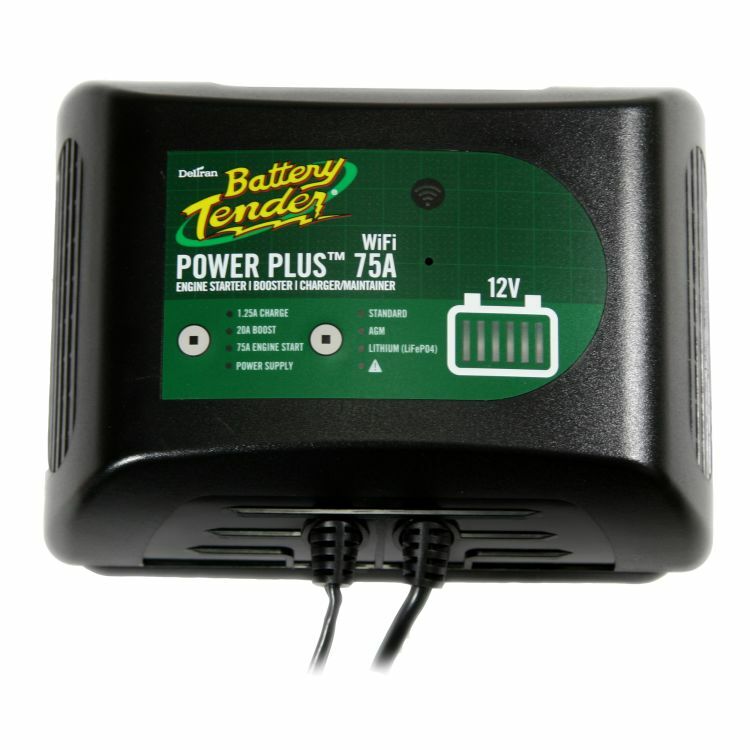 The Battery Tender Power Plus 75 Amp Booster Battery Charger has more power and can charge batteries big and small. Integrated Wi-Fi lets you connect your charger to the internet, get alerts, and control your charger from your iOS or Android device. 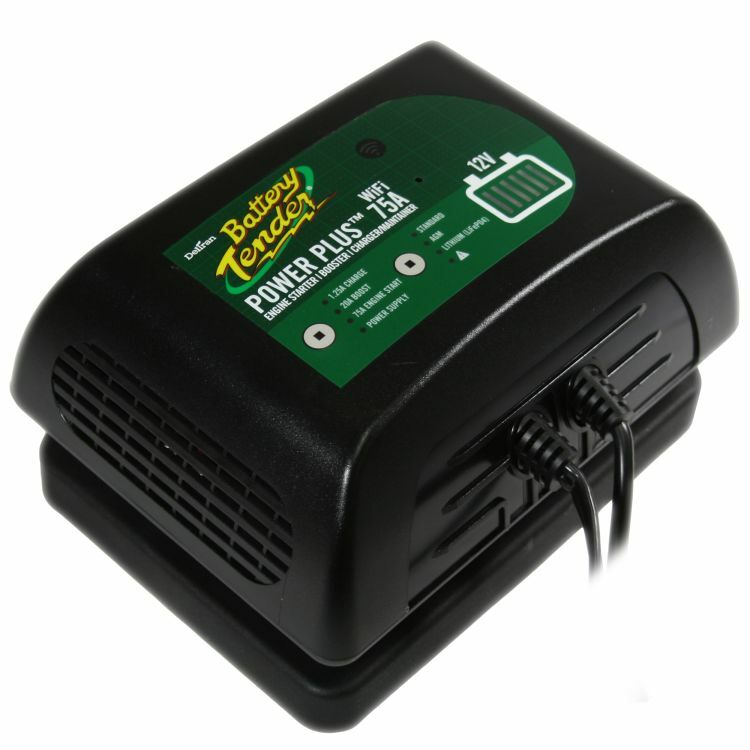 With the Battery Tender App the power plus series charger gives you the power to connect your battery to the internet. A charger for every situation Packed with new features, an internet connection, and the latest technology. The unit features a 1.25 amp standard maintenance charge, a 20 amp boost charge, a 75 amp engine assist setting, and a power-supply setting. 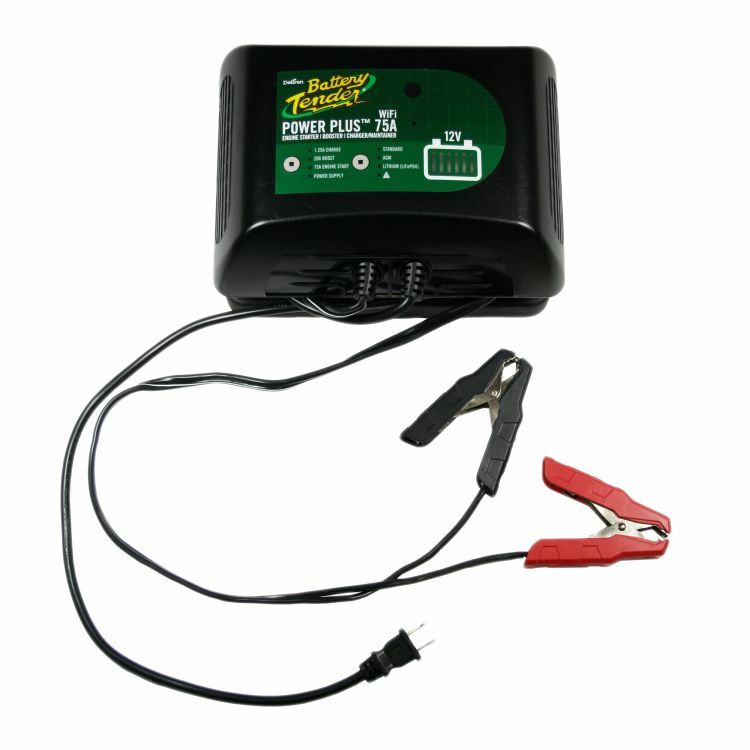 The 1.25 Amp setting will charge and maintain a 12 volt battery for long periods of time. This function is completely automatic and will never over charger your battery. For larger discharged batteries the Battery Tender Power Plus features a 20 Amp Boost Mode. The Boost Mode will Boost the battery at a maximum rate of 20Amps until the battery voltage increases to approximately 14 volts. When the battery voltage reaches the target, the charger then exits the Boost mode to the normal 1.25 amp charge mode (Li-Ion batteries are not supported in Boost mode). The 75 Amp Engine Start Assist mode will first use 10 Amps to increase the battery voltage to at least 10.5 volts. Once the battery reaches 10.5 volts, the charger is ready for an engine start. If the voltage is less than 9 volts, the charger assumes the key has been turned. Now the charger applies up to 75Amps to assist starting the engine. After five (5) seconds, the charger will stop the 75Amp current and go into cool down mode for two (2) minutes (Li-Ion batteries are not supported in Engine Start mode). The Power-Supply mode will provides low voltage DC current of one (1) Amp at 13 volts. The Power Supply function is for use as only a memory saver when changing out a battery. Output: Charging and Maintaining @ 1.25 Amp, Battery Boost @ 20A (Lead Acid Only), Engine Start Assist @ 75A (Lead Acid Only), 1 Amp 13V Power Supply. Do you own the 022-0227-DL-WH? Please, tell us what you think about it. It helps us provide you with better products. Please note that it may take up to 72 hours for your review to appear.